Sarov, August 2, Interfax - Patriarch Kirill of Moscow and All Russia believes that increasing number of Orthodox churches in Russia witnesses that the mission of the Russian Orthodox Church is required by people. “Only for the last six years our Church increased for 5,000 churches and 10,000 clerics and it means that people need the church mission. As there cannot be such growth of the Church if there is no people’s demand. 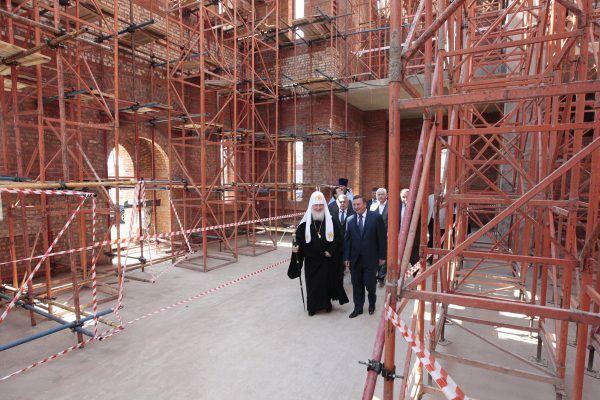 That is why we feel so special when we lay down foundations of new churches,” the patriarch said at the ceremony of laying the first stone to the foundation of the Assumption Cathedral of the Sarov Hermitage, where St. Serafim of Sarov lived. The patriarch has recently said that churches in Russia are built because people have such need, not by order. “Not because someone ordered to build, but because enormous power of our people’s faith support the wish of authorities,” the church primate said on July 28 after consecrating the restored Church of Smolensk icon of the Mother of God in Oryol.